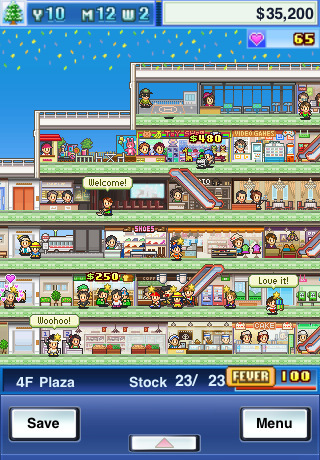 A handful of games down the line, you should know what to expect from Kairosoft by now, but that doesn't make it any easier to resist the obsessive allure of its bite-sized management sims. This time around, you must prove yourself as a retail maestro, with 15 years to build a "five-star mall of mega proportions". With little more than loose change in the bank, the first few years are a meek struggle to ensure that your bakery, grocery store, florist and cafe don't keep running out of stock before the day's even over. But with the inexplicable loyalty (and investment) of a few local regulars, you'll gradually accumulate enough 'hearts' to reinvest in providing new services that, ultimately, attract more custom to your ramshackle retail outfit. Over time, of course, you inch your way to respectability, and can start to offer better quality goods and a wider variety of stores. And with cash in the bank, you can also work on promoting yourself better, hire better staff and figure out effective ways of coaxing the local community to your burgeoning enterprise. The upshot is that Mega Mall Story quickly gets under your skin, just like you hoped/feared it would. With its familiar interface, simple mechanics and hummable ditty, resistance to its effortless charm is completely futile. At this stage, you might as well buy shares in Kairosoft. Used under license from Eurogamer. Requirements: Compatible with iPhone, iPod touch, and iPad. Requires iOS 3.1 or later. What's Hot: Super addictive, cute retro style graphics, excellent interface, tried and true formula. What's Not: It could dominate your life.